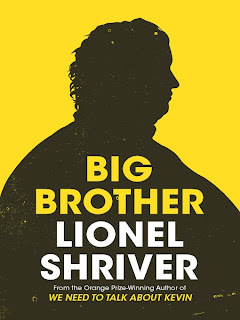 I wonder if I would have formed the same opinion about Lionel Shriver’s latest novel Big Brother, about a woman who takes it upon herself to help her morbidly obese older brother to lose 16 stone, had I not already known that Shriver’s real-life brother was similarly overweight and died (almost certainly as a result) at 55. It’s possible that I might have been less sympathetic to the narrator of Big Brother, an almost reluctantly successful entrepreneur from a somewhat dysfunctional showbiz family, if I hadn’t read of Lionel Shriver’s own pain at her brother’s ill-health, as on the face of it, I couldn’t find a great deal to like about Pandora for her own sake. Neither, in fact, could I find much to like about her husband Fletcher, whose obsession with health food is clearly an eating disorder in its own right, or Edison, the ‘big brother’ of the title. Not that this should matter – it’s possible to care about characters without finding them likeable – but their company became frustrating at times, not least because I found them all rather two-dimensional. Edison, a jazz musician, speaks in dated jive talk, all ‘dig’ and ‘cat’ and ‘man’. Admittedly this is disparaged in the novel, with Pandora admitting that it seems ridiculous but asserting that this is really how those on the jazz scene (and Shriver is married to a jazz drummer, so I assume she would know) - but it doesn't make it any less irritating or cliched. Also, it appears that because Edison is fat, he must also be crass, untidy and clumsy – because hey, all fat people are, right? Pandora’s father Travis is a TV actor who obsesses endlessly over his long-gone 70s heyday, and, like Edison, I found him stereotypical and unrealistic; ditto Pandora’s sullen stepson, a standard-issue moody teenager, and her sweet stepdaughter, whose cute, saintly demeanour simply doesn't ring true, even when it's rather endearing. That said, Big Brother still bears many of the hallmarks that made Shriver’s smash-hit We Need To Talk About Kevin such a gripping read. The astute commentary on marriage and family relationships is once again compelling, as is the novel's sharp topicality, the unreliable narrator and the often acutely uncomfortable viewpoint from which she tells her story – such is Pandora’s all-out revulsion at Edison's behaviour and condition that I felt desperately sorry for him, while at the same time knowing that I’m just as guilty as she is of having certain kneejerk reactions to those who are vastly overweight (even as someone who used to be five stone heavier than I am now, no stranger to being fat). Big Brother’s observations on Western relationships with food in the 21st century are also sharp and relevant, although at times made the book feel more like an essay than a novel. Big Brother is also strong on family resentment and rivalry. Pandora, for all she professes to love her husband Fletcher, is constantly in competition with him and threatened by his physical fitness; knowing that he insists on sticking to a strict, obsessively healthy diet while she is somewhat overweight, she leaves him bite-sized samples of desserts that she leaves, tantalisingly presented, in the kitchen for him to find. Fletcher himself seems to be inwardly bitter that his own business as a furniture-maker is infinitely less successful than Pandora’s company. Baby Monotonous makes bespoke dolls that parrot the pet catchphrases of clients’ loved ones, an enterprise Fletcher calls Baby Moronic despite it buying his home and feeding his family (his teenage children having been adopted by Pandora after a custody battle with their drug addict mother). This competitive undercurrent extends to Pandora and Edison, too - one point, Edison even suggests that his binge-eating was triggered by seeing his sister on the cover of a business magazine while his career as a jazz pianist was in irrevocable decline – and, most of all, between Edison and Fletcher, polar opposites openly vying for Pandora’s care and attention. The book is split into three sections. The first deals with Edison’s arrival for a two-month visit, having found himself homeless and not having seen his sister for four years. During these years, he has more than doubled in weight and is now struggling with mobility and sleep apnoea, and his presence in the neat, ordered family home causes a constant strain, partly because he is careless and untidy but mostly because his immense bulk and eating binges embarrass and repulse the rest of the family. The second section follows Pandora’s decision to risk her marriage by moving out of the family home to supervise Edison on an all-liquid, protein shake extreme weight loss diet. The third – well, it would be giving away far too much to reveal what happens here, but I will say that the final part of the book struck me at first as a terrible cop-out but then, when I really thought about it, seemed brave and even redeeming. A foreboding cloud of guilt hangs over this novel, which seems all the more poignant in the context of Shriver's own relationship with her late brother. Big Brother raises pertinent questions about the way we look upon those who are extremely overweight and about the irreversible effect of our childhoods on our adult lives. Despite its faults – the flatness of most of the characters and the tendency to drift into polemic, for instance – this is a thought-provoking and sometimes unsettling read that is at once spikily satirical and deeply sad, without any trace whatsoever of sentimentality.